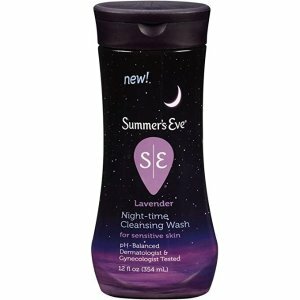 Amazon.com offers the Summer's Eve Night-Time Cleansing Wash, Lavender, 12 Ounce for $4.98. Features: Summer's Eve Night-time cleansing wash combines a soothing lavendar fragrance with chamomile botantical extracts to calm and relax you for a great nights sleep. Our nighttime wash is specially formulated for your external vaginal area, won't dry like soap, and is gentle enough to use all over. Start Fresh, Stay Fresh with Summer's Eve.